Desert City, belonging to Garciagerman architects, has been chosen among 40 others (out of more than 380 projects) to qualify for the European Prize for Contemporary Architecture – MIES van Der Rohe by the European Commission and the MIES van Der Rohe Foundation. At Lamp, we are very proud of being a part of this project which, without doubt, represents very well the current contemporary trends in the world of the architecture. Desert City, located in San Sebastián de los Reyes (Madrid), is a biotechnological garden centre of 5000 m2 specialized in Xero-landscaping. It grows, exhibits, researches and sells cactus and other xerophytic plants (those that tolerate great droughts). The project puts forward a commercial, educative, sustainable and ecological complex where leisure and scientific activities are combined. 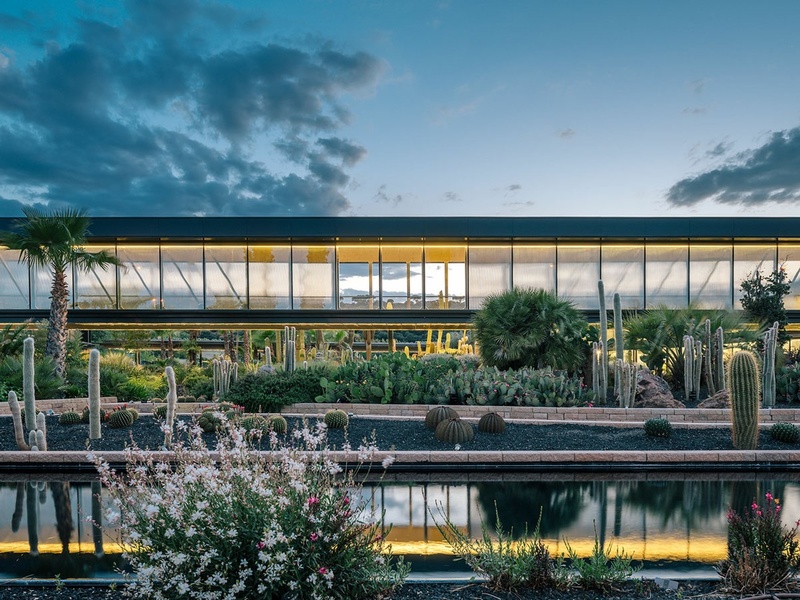 The complex is structured by a sequence of organized symmetries based on the repetition, modulation and prefabrication of elements, located around a cactus garden similar to a cloister, which welcomes newcomers. There is also a greenhouse space covered by a cable roof. In turn, the facade is made of glass and the building incorporates sustainable solutions such as transparent photovoltaic glass, geothermal energy, water recovery systems, solar controls, among others. The interior lighting is conceptualized to get the highest pragmatism, achieving functional and quality lighting through FIL, a luminaire that, due to its versatility, can be integrated into different spaces, from educational workshops to restoration to exhibition areas, maintaining the same formal coherence and providing the necessary lighting effect by means of its various versions: Recessed luminaire, suspended with direct and indirect light emission, or through structures designed with joints that allow connections at 90º angles. All luminaire is adjustable using the DALI protocol. The European Prize for Contemporary Architecture – MIES van Der Rohe was established in 1987 and is awarded every two years. This edition's jury is formed by Dorte Mandrup, George Arbid, Angelika Fitz, Ștefan Ghenciulescu, Kamiel Klaasse, María Langarita, and Frank McDonald.